Trentino is known as one of the most spectacular regions in Italy. Its landscapes will captivate you with impressive mountains, breathtaking lakes and cute little villages nestled in idyllic valleys. Its beauty changes dramatically through the seasons, so no matter what time of the year you visit, you are guaranteed to totally fall in love with it. But if you are looking for a bit of winter magic, then Val di Sole in Trentino is the place for you. 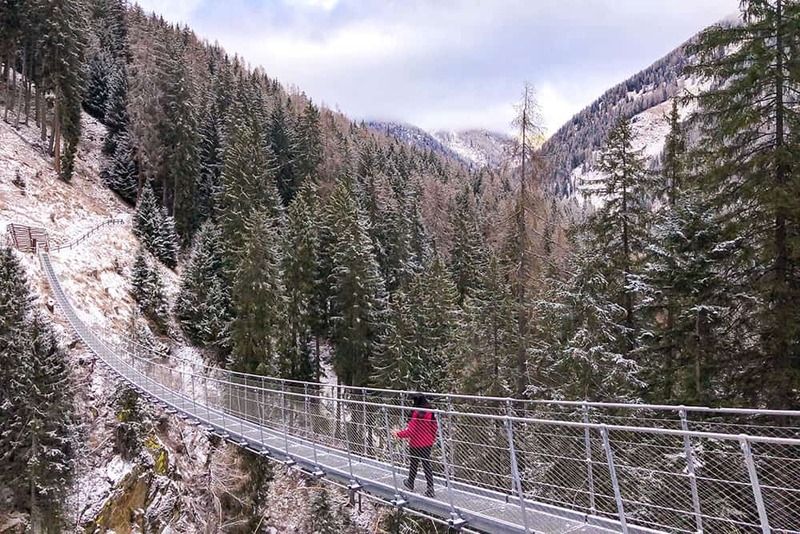 So here are eight awesome things to do in Trentino in winter that will get you planning that getaway in this snowy wonderland. I’ll start with the obvious one. If you are going to visit Trentino in winter, my first suggestion will be, of course, skiing. Val di Sole has 270 km of slopes, of which over half are interconnected. If you are an experienced skier or snowboarder, the descents in the Folgarida Marilleva, and Madonna di Campiglio Pinzolo skiing areas will take your breath away. But there is something for everyone no matter your experience. Almost half of the slopes are medium level and over a third are easy. If you don’t ski or snowboard at all but you would like to learn, there are plenty of ski schools in the area. I personally recommend the Italian Ski School Val di Sole Daolasa. I hadn’t skied for 5 years, and the last time I did I broke my knee, so I was understandably a little bit nervous. My instructor Tiziano made me feel at ease pretty much straight away and I spent a couple of hours doing some practice runs with him until I got my confidence back. If you don’t ski, you can still go up to the ski area and soak up the atmosphere. Take a sit on one of the rifugi and enjoy the views, and the skiers and snowboarders coming down the hills. The lifts are very easy to reach thanks to a great public transport network, and the area has plenty of facilities for the rental of the latest ski and snowboard gear. After a day in the slopes, it’s time for an obligatory après-ski drink that will keep you going until it’s time for dinner. The drink to have in the North of Italy in winter is the bombardino, a strong but easy to drink alcoholic beverage that is very similar to eggnog. It’s made with egg, coffee, brandy, Zabaione egg liquor (Italian eggnog), syrup and cream on top for extra indulgence. It’s pretty potent, so it’s guaranteed to warm you up! For something a bit milder but equally traditional in Trentino’s ski resorts, try vin brulé, a steaming mulled wine infused with various mulling spices such as cloves, star anise, cinnamon, and nutmeg amongst others, and finished off with a slice of orange. It is the true taste of winter and super comforting after a day in the snow. There is no doubt that skiing and snowboarding are physically demanding activities, and by the end of the day you may be ready to hit the bed early. But before you do that, make sure you get yourself to the spa. Many of the hotels in Val di Sole have a wellness centre, so you will have plenty of choice. If you are staying in Dimaro, a lovely village located in the heart of the valley, I can recommend the hotel of the same name, Albergo Dimaro, which has a lovely whirlpool tub big enough for ten people easily, a sauna and a steam room. They also offer lots of different kinds of massages. If you are looking for something with a wow factor, Rifugio Orso Bruno has a hot tub with a panoramic view of the mountains. It’s perfect to enjoy the sunset with a nice glass of local wine in hand. One thing that Trentino is not short of is mountain huts or rifugi overlooking the slopes. They are great places to grab lunch or an après-ski aperitif. But try and visit one for dinner too to enjoy the starry night and discover more of the local cuisine. Some of these huts are only accessible by cable bar, which close before it gets dark. However, you will find that some rifugi, like Rifugio Albasini, will come and pick you up by snowmobile! The food at Rifugio Albasini is hearty and truly outstanding. I had canederli in brodo (dumplings in broth), tagliatelle con funghi (mushroom sauce) in a parmesan cheese basket, monchi con pancetta (giant polenta gnocchi with bacon), cervo con tortel di patate (venison with potato cakes) and millefoglie (the Italian version of millefeuille). There was a lot of food but it was so good that I managed to eat it all. After desert, wine and grappa, it was time to return to Dimaro, which meant another trip down the hill on the snowmobile! It was so much fun, that it really added to the experience of having dinner in a mountain hut at 1,860 metres. Italy and delicious food go hand in hand, so of course, one of the things to do while in Trentino has to be trying as many of the typical dishes as you can. The local answer to a good winter warmer is canederli, a boiled bread dumpling normally stuffed with sausage meat and speck, or with cheese, and often served in vegetable stock. Of course, pizza has to be included in the menu. We’re in Italy after all, so any pizza you order is going to be good, but I’d recommend the local specialty of Pizza Trentina, with mozzarella, Trentingrana cheese and rocket… lots of it! Or you can order half and half, which is what I did wanting to try everything. If you happen to order it in Rifugio Spolverino, be ready to be impressed. Apart from delicious, their pizzas are enormous, and the panoramic views over the Dolomiti di Brenta mountains are truly spectacular. Trentino is also famous for its apples. They have been locally grown for almost one hundred years by what is now a group of family-run cooperatives called Melinda. Their Golden Delicious apple has been given ‘Protected Designation of Origin’ (PDO) and it really lives up to its name – truly delicious! If you enjoy a good wine, Lagrein is a local grape variety that you also must try. Originally from Trentino’s Vallagarina, this ancient grape has been cultivated since at least the 17th century. It is very mild in flavour and according to wine experts it’s perfect to accompany winter dishes. But I would drink it all year round! Eating is one of life’s biggest pleasures, particularly when you are in Italy. But there is something to be said for eating Italian food that you have prepared yourself with the guidance of a local. Plus cooking classes are always fun and a great way to get to know about the local food and produce. We visited Agritur Solasna, an old farmhouse that dates back to the 1200s, and is located in the charming village of S. Giacomo, overlooking the valley. Nicoletta, the owner, produces everything you can think of in the farm – vegetable and fruit preserves, sausages, dried porcini, and she even makes her own cheese. We spent the morning with Nicoletta learning how to make canederli and torta di mela (apple pie). It was a really fun thing to do in Trentino, and the place felt really cosy with the heat of the ovens and the stoves coming through, especially with it being so cold outside. Of course, we ended up eating our own creations for lunch, as well as lots of other delicious food that Nicoletta prepared for us. We also got to say hello to the farm animals, the chickens, sheep and Galileo the donkey. Just off Val di Sole you will find Val di Rabbi, one of Trentino’s most beautiful valleys. It borders with Stelvio National Park, so its natural environment has been kept pristine and almost intact. Val di Rabbi is famous for its water, well known since ancient times for having therapeutic properties, which has been the driving force behind the spa industry in the area. We started this spectacular hike at the public car park along the river, on the first left turn past the village of Rabbi. We walked along the river for a little while which was truly idyllic, with the snow-covered fields and mountains around us, and the cute wooden houses on the banks. Before we got to a bridge, we started climbing on some stairs, and kept climbing until we reached the stunning Rigaioli Waterfall, which was partly frozen. It was a beautiful sight. And right above the waterfall was the small but spectacular Ponte Tibetano, a suspension bridge over the canyon. I was expecting to see pretty scenery on this hike – Trentino, after all, has some of the most dramatic landscapes in Italy. But I was not expecting it to be so breathtaking. Ossana is a charming little village located in upper Val di Sole that is famous for its medieval castle, Castel San Michele. The castle offers some great views of the village and the mountains. But once a year, from 30thNovember to 6thJanuary, Ossana becomes a mecca for Christmas lovers. This village of approximately 850 people puts on a show with the display of 1,000 Nativity scenes. There is a trail that goes through the village that will take you through all these beautiful pieces of art, some of which come from distant parts of the world. Ossana has also managed to incorporate a bit of local history in these Nativity scenes, with one of them depicting the story of the events that happened on one Christmas Day during World War I. There is also a special tribute to the tragic airplane crash that happened on 22ndDecember 1956 on Mount Giner in the Ossana area. Set in the village of Dimaro, Albergo Dimaro features a spa with indoor pool and sauna. The rooms are comfortable and have everything you need including a TV. A private ski bus is provided to the Daolasa ski lifts, 3.1 miles away. Il Maniero is located in the charming village of Ossana, at the foot of Stelvio National Park. Conveniently situated for skiing, the free ski bus to the nearest ski slopes stops in front of the hotel. The hotel restaurant is famous for its top notch pizza and pasta. There are plenty of choices for airports to fly into which are easy for getting to Trentino. The most convenient large ones are Verona, followed by Venice Marco Polo, which are a great opportunity to extend your trip and visit Venice or Verona. Other airports that are relatively close are Bergamo, Insbruck, Milan (both Linate and Malpensa) and Bologna. I use Skyscanner to check the best deals on air fares. I would recommend having your own car to have the freedom and flexibility to explore this beautiful region of Italy. But car hire can be expensive, use the Holiday Autos comparison site to get the best deal from 20+ providers. From Verona airport there is a short shuttle bus journey to Verona Porta Nuova station, and it’s only 40 minutes from there by train or just over an hour by bus. There are also a direct trains and buses from Venice to Trento. You can compare the most convenient times and get the cheapest deals with GoEuro. Would you like to know more about visiting Trentino in winter? Ask me any questions in the comments! Disclosure: A big thank you to Visit Trentino who hosted me on this trip. As always, all views are my own. This post may contain affiliate links, that earn me a small commission but come at no extra cost to you. Thanks as always for your support! I went last February and loved it! Love the idea of doing cooking classes out there too.